A highly decorated general and one of the most prominent combat commanders in American history, General David Petraeus (U.S. Army, retired) has dedicated his life to public service, leading military campaigns in Iraq and Afghanistan and then serving as the director of the Central Intelligence Agency. One of the most effective military leaders in recent U.S. history, General David Petraeus—a highly decorated four-star general, whose distinguished military career spanned over 37 years and culminated in six straight commands (five of which were in combat)—addresses the most significant global challenges facing us today, including ongoing international security issues, macroeconomic trends and the tasks of strategic leadership in the 21st century. Widely credited for changing the course of two wars—by dramatically reducing the violence in Iraq when he led the so-called “Surge” and by halting the Taliban’s momentum in Afghanistan when he led the operation there—Petraeus was also instrumental in reshaping American military doctrine and then in implementing it when he led the conduct of comprehensive civil-military counterinsurgency campaigns. Serving in multiple campaigns—including nearly seven years deployed following 9-11—Petraeus has been described as one of the “great battle captains of American history.” His command during many years in combat has resulted in comparisons to Ulysses S. Grant, John J. Pershing, George C. Marshall and Dwight D. Eisenhower. Following his military service, Petraeus led the CIA, where he oversaw significant achievements in America’s global counter-terrorism campaign, pursued a substantial initiative to increase worldwide intelligence coverage, guided the development of a strategic plan for the agency and oversaw the establishment of a new Economic Security Center. Petraeus has received numerous prestigious U.S. military, State Department, NATO and United Nations awards, including four Defense Distinguished Service Medals, three Army Distinguished Service Medals, the Secretary of State Distinguished Service Medal, the Bronze Star Medal for Valor, the NATO Meritorious Service Medal and the Combat Action Badge. Additionally, he has been decorated by 12 foreign countries. 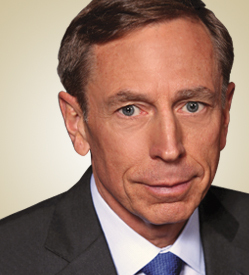 Petraeus currently serves as chairman of the KKR Global Institute (a global private equity firm), as a visiting professor of public policy at CUNY’s Macaulay Honors College and a Judge Widney Professor at the University of Southern California.